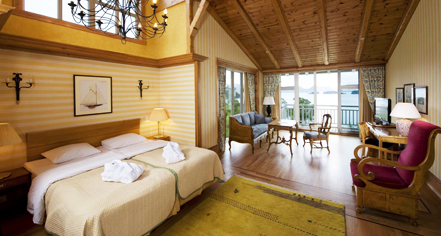 Individually decorated with personalized charm, the comfortable 135 guestrooms at Solstrand Hotel offer a variety of amenities, many with wide panoramic views of the fjord. Offering queen-size beds and south facing windows toward the fjord, Deluxe Rooms are brightly-lit and feature balconies with magnificent views of the glacier and water. Located in the historic part of the hotel, Junior Suites are equipped with queen-size beds and offer breathtaking 180 degree views of the fjord and garden from either a balcony or private terrace. Along with a comfortable queen-size bed and combined shower and bathtub, Executive Rooms are located on the ground floor with private terraces and an astonishing panoramic view of the fjord and wellness garden. 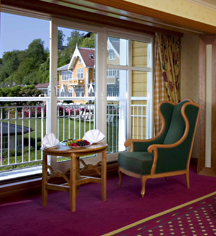 Standard Rooms have beautiful fjord views overlooking the garden and a separate lounge area.